This simple coleslaw recipe is one of those side dishes that we can’t get enough of in the summer. It’s THE perfect salad to serve at any barbecue, not to mention that it is absolutely amazing when paired up with fried chicken. Think KFC Coleslaw recipes that rock. Because if you’ve ever been to KFC, you know that one of the classic side dishes is the famous Kentucky Fried Chicken Coleslaw. As it should be–because it is just delicious, fresh and did I already say delicious? 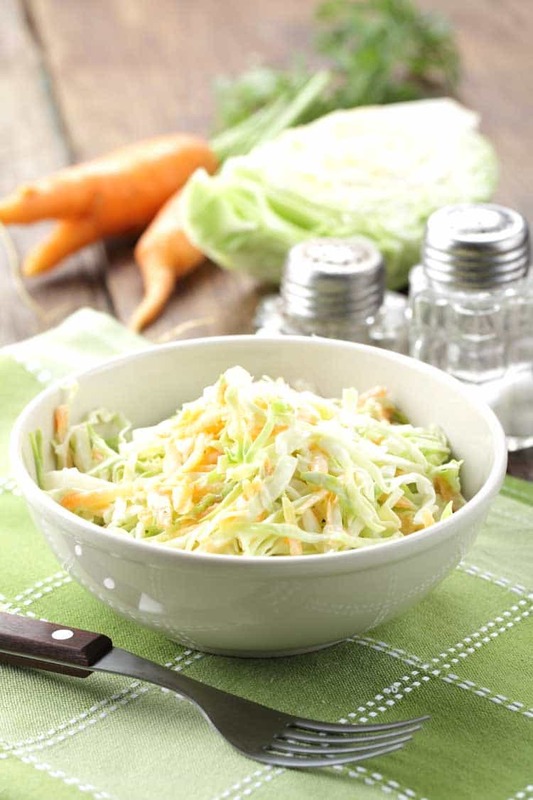 Coleslaw isn’t just a side dish, although that is what it is mostly known for. It’s also an utterly fabulous topping for sandwiches. Like on our BBQ Chicken Sandwich and Pulled Pork Sandwich recipes. This recipe makes enough for 12 servings, so there is plenty to share. Why not bring it to a potluck when asked to bring a dish to share? You can easily whip it up the night before so there is less to do the day of the event. 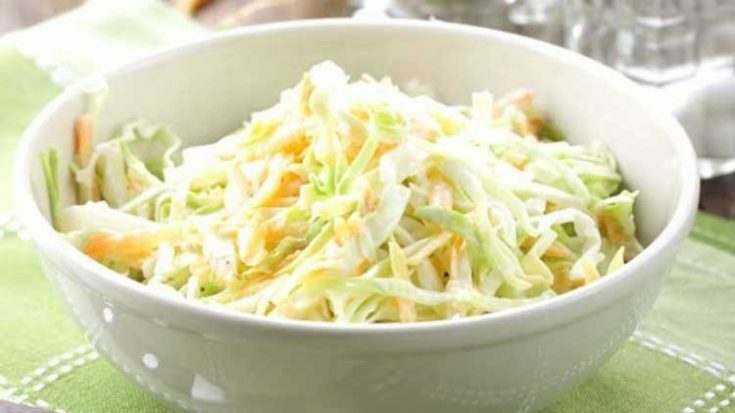 Cole slaw is one of those recipes that most people already have the ingredients for. People enjoy putting it on their hamburgers, hot dogs, and eating just as it is. And eating it…well, that’s the best part. Isn’t it? One of the things that makes this recipe even faster and easier to make is a food processor. I honestly would be lost without mine when it comes to preparing recipes with ingredients that are shredded. Because like it or not, shredding is an essential step for many recipes. And ingredients like cabbage in this recipe, or cheese in many other recipes–well, shredding those essentials just makes the recipe perfect. If you don’t already have a food processor, you can get one here and get free shipping with Amazon Prime free 30 day trial. Get more amazing copycat recipes here or buy restaurant gift cards online and go out to enjoy your favorite restaurant meals. They also make perfect gift ideas! 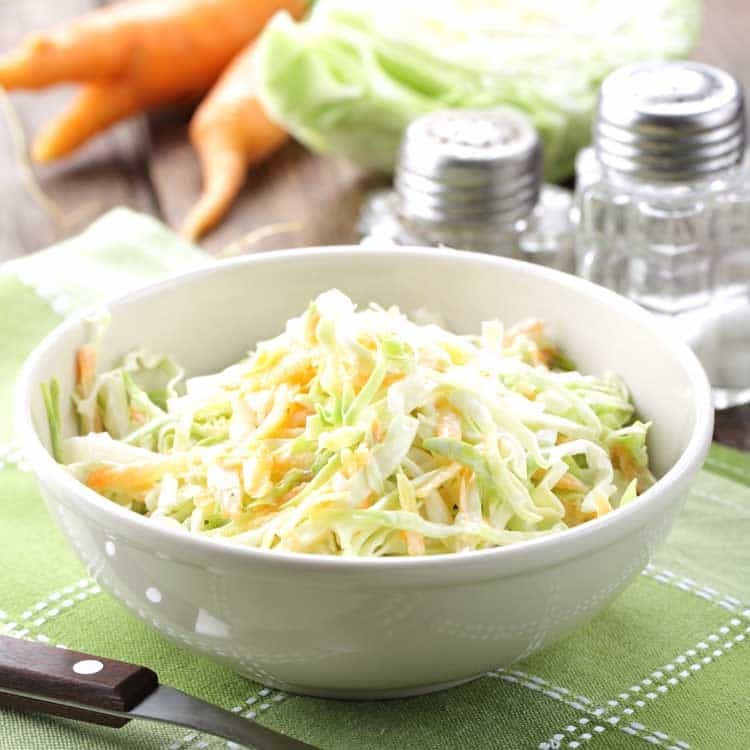 Combine cabbage, carrots, and onion in a large bowl. Pouring mixture over cabbage, mix thoroughly. Cover bowl and place in refrigerator for 5 hours.